ATLANTA, GA, Apr 25, 2012 (MARKETWIRE via COMTEX) — Moe’s Southwest Grill, the fast-casual restaurant franchise best known for its fresh, create-to-order burritos and signature “Welcome to Moe’s” greeting, is celebrating Cinco de Mayo, or as the folks at Moe’s would say, Cinco de Moe’s, in true Moe’s style: fun, laid-back and family-friendly. 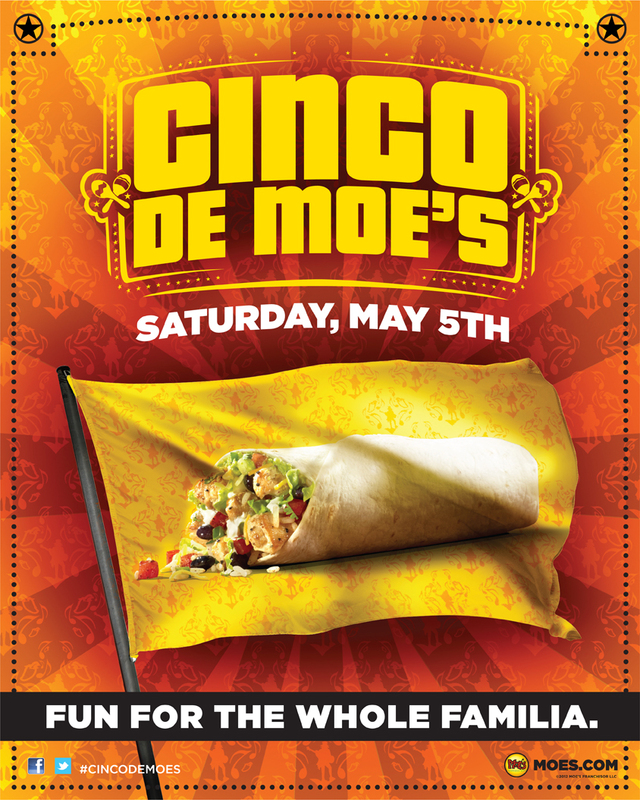 While each location is hosting its own unique celebration including a variety of different specials and discounts, every participating location nationwide is offering the first 100 guests in line at 11 a.m. on May 5 a free limited edition 2012 Cinco de Moe’s t-shirt. Fans of Moe’s Southwest Grill are encouraged to share Cinco de Mayo photos and feedback via Twitter using the hashtag #cincodemoes. Moe’s Southwest Grill uses Cinco de Mayo as an excuse to celebrate originality, or the freedom to choose from more than 20 fresh, free ingredients and a variety of protein options including all-natural chicken, 100 percent sirloin grass-fed steak, grain-fed pulled pork and organic tofu, every day. And as always, every meal is served with free chips and salsa. To learn what Cinco de Mayo specials may be offered at your neighborhood Moe’s, visit http://www.moes.com to find and call your local Moe’s. About Moe’s Southwest Grill Moe’s Southwest Grill is a fast-casual restaurant franchise featuring fresh southwest fare in a fun and engaging atmosphere with over 440 locations in 33 states. At Moe’s, each meal is prepared right before your eyes and is served with free chips and salsa, including the Homewrecker burrito, the Billy Barou nachos, and the Close Talker salad. Founded in 2000, Atlanta-based Moe’s Southwest Grill was ranked #1 in category in Entrepreneur’s Franchise 500 in 2010 and is a Gold Award winner of the 2008 Consumer’s Choice in Chains Awards. For more information, visit http://www.moes.com .